Panasonic's new PT-RZ570U is part of its SOLID SHINE line of projectors. 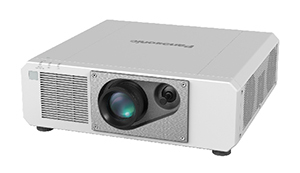 Panasonic has introduced a new laser phosphor projector designed for mid-sized classrooms with about 50 students. According to the company, the 1-Chip DLP Solid Shine laser phosphor projector should offer 20,000 hours of maintenance-free operation and 5,000 lumens of brightness. With the latest DLP module for WUXGA resolution and solid-state laser diodes, the PT-RZ570U, part of Panasonic's SOLID SHINE line of projectors, has a four-segment Quartet Color Harmonizer color wheel that reduces energy loss from the light source, which is said to boost brightness and improve color accuracy. Panasonic officials said the low maintenance cost and the fact that the PT-RZ570U has a sealed optical engine block make the projector economical for education institutions. "In particular, we hear from our education customers that they are looking forward to laser technology with low maintenance operation, to reduce stress on their increasingly overburdened technology support staff," said John Baisley, senior vice president of visual and imaging business operations for Panasonic of North America. "The PT-RZ570U projector delivers that exactly." The projector allows video and control signal transmissions using a single-cable connection of up to nearly 400 feet, when used together with an optional digital link switcher. A combination of technologies, including an efficient cooling system and heat sink, means operational noise is low. The PT-RZ570U is also capable of free 360-degree installation, both horizontal and vertical. In addition, dynamic contrast helps achieve 20,000:1 contrast, modulating light output frame-by-frame according to image requirements, for deeper blacks and improved definition. MSRP for the PT-RZ570U is $9,499. For more information, go to the Panasonic site.